CeeVee.com is cool and fast way to build your resume online. How cool? If you have already filled out your work portfolio on Facebook, you can easily grab those information through "Connect with Facebook" login. Your resume will be automatically filled with the most pertinent contact and experience portions. 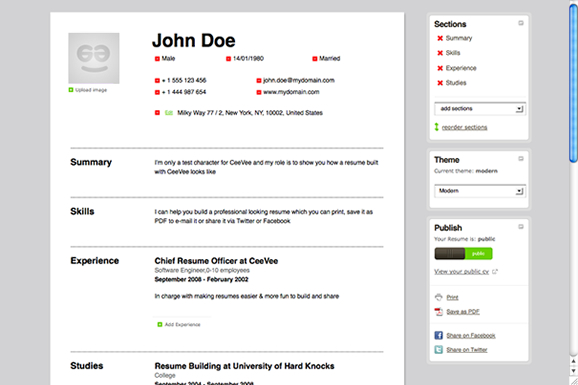 CeeVee also makes the Resume editing easier by providing sectional editing that leaves the page looking good. You can also share your resume online. CeeVee can provide you a custom URL like ceevee.com/yourname and badges that you can embed to your website. 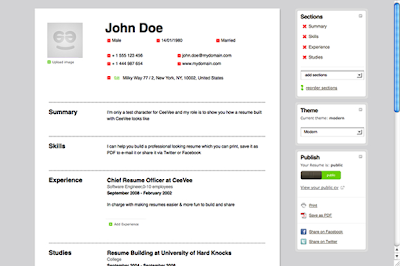 Interested visitors can look at your resume and can easily print or save it to PDF. Get your free CeeVee Resume.